We are delighted to announce the launch of our new Commercial Vehicle Promotion. 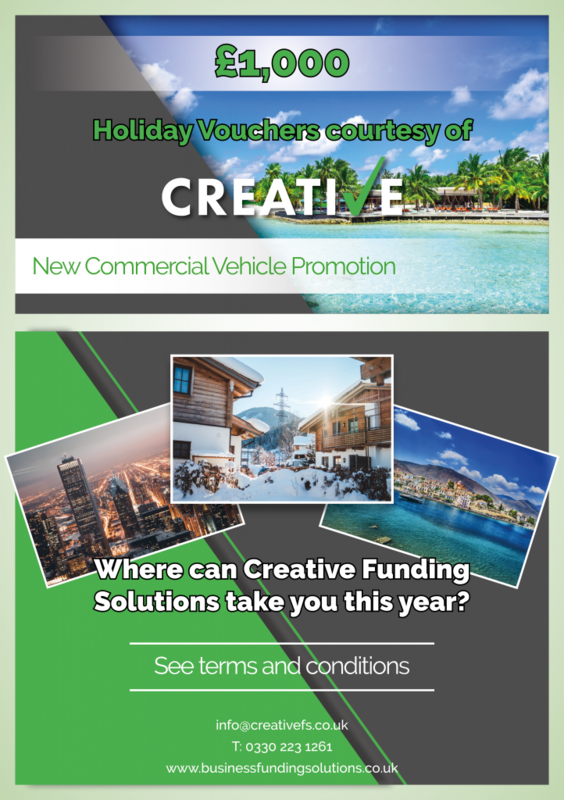 Running until the end of April 2019, we are giving our lucky winner £1000 worth of holiday vouchers courtesy of Creative Funding Solutions. Step 1 – Introduce a new Commercial Vehicle Finance case to Creative Funding Solutions. Step 2 – If the finance is approved you will be entered into the draw. Unlimited number of entries during the qualifying period. The winner will be drawn at random from all of the entries received and the lucky winner will be notified through their Account Manager upon conclusion of the competition. As a Commercial Vehicle Dealer (Light or Heavy) if you introduce a finance case for a NEW Commercial Vehicle that is approved between now and the end of April 2019 you will be entered into a prize draw for £1,000 of holiday vouchers. One ticket per approved finance case. Entry is free, with a qualifying introduction, the ticket itself is irredeemable and has no cash value. This promotion is solely intended for our business partners. If you have received this promotion but are not a business partner of ours, you are not eligible to enter the competition. Creative Funding Solutions Limited is a brokerage regulated by the FCA. FRN 631176. If you have any questions please get in touch with us through either our website, social media channels, or email marketing@creativefs.co.uk and we will be happy to help!